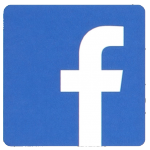 If you are looking for highly interactive. Common sense. Hands-on, real-world sales training and coaching workshops. Read on. In sales, success is not determined by what you know. Success is a direct result of what you do. So in our workshops, we focus on EXECUTION and not just education. I’ve done lots of Sales training over the years and I have to say hands down it’s the best Sales training I have ever done. The methodology used is practical and makes you think how you can really improve. At other training sessions there is normally a conversation afterwards discussing how bad or boring the session was but not here, everyone is really engaged and getting lots from it. And we practice what we preach in our workshops. We want to understand your goals, your priorities and the specific results you want, first. Then we will design the perfect workshop for you. No me-too stuff here. 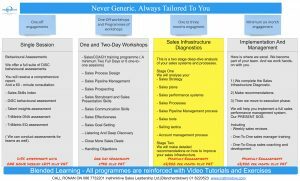 I know it is cheaper and easier to churn out generic sales workshop formats. But you won’t be blown away. And you won’t get the results you deserve. So, if you want results and NOT content. Read on. I can show you how to make a lot more profitable sales, sustainably. Because I’m going to teach you what it took me 30 years to perfect. Fact-based. Experienced-based. And proven systems and strategies to generate results. It won’t require superhuman powers to learn. It doesn’t require massive investment. However, it will require an enormous commitment to execution. After we walk away. And the payoff will be immediate. You will see results. Just read our testimonials. I’m not making shallow promises I can’t keep. There is no magic formula, strategy, or tactic to learn. Just simple, practical, actionable advice that works. Here are just some of the short programmes we offer. REMEMBER I’ll tailor every workshop to your needs. A complete end-to-end design and visualisation of a dynamic sales process. How to transform from forecasting (which let’s be honest is rarely accurate and probably useless). To an active sales opportunity management system. I’ll teach you our 10-Step process to ACCELERATE sales pipeline. I’ll show you how to prospect effectively. You will learn the multi-tactic prospecting process. You will also create a complete sales prospecting playbook. Sales prospecting made easy. You will learn how to create a compelling sales story. You will then learn how to leverage the sales story throughout your Sales Process. Then you will learn how to pitch with perfection. Using the DiSC behavioural assessment tool. You will learn how to adjust your communication style to drive engagement. You will learn how to mirror-and-match your style of communication with others. I’ll also teach you some invaluable tips to improve your writing skills. Only 35% of a sales person’s time is spent selling. So in effect salespeople have become administrators. I’ll show you how to maximise your time. Transform your effectiveness. Increase selling time. And grow sales faster. You will learn how to set sales goals that deliver results. You will focus on the key sales activities that drive results. You will create a simple one-page sales plan for your top sales goals. And I’ll show you how to become a disciple to the plan. You will learn our unique EXAMINE Questioning Process. Transform your sales engagements. It is a proven process that results in more challenging sales conversations. You will gain deeper insights. And your clients will love it too. Call me a big old sceptic (I have been called a lot worse). But experience has taught me that the reason we fail to close deals. Is because we didn’t open the sales deal properly. You will be dissecting some sales deals you lost. And like a doctor diagnosing a patient. You will complete a full end-to-end diagnostic of your lost sales deals. When we have isolated the problem. We will then focus on how to fix it. You will learn my INCREMENTS model. You will learn how gaining small incremental commitments is the modern way to close more sales deals. Oh, dear, I hear you say. I thought you said you didn’t churn out the old reliables, Ronan? Well in this workshop we dispel the myth that handling objections is a phase in your Sales Process. I’ll get you to map out all of your client’s FEARS. And we will work together to map out the best strategies to remove those FEARS. You will be an expert in Eliminating No. Talk to Ronan directly on 086 7732201 or email him here to find out more about how to generate More Profitable Sales. More Sustainably. In Less Time.